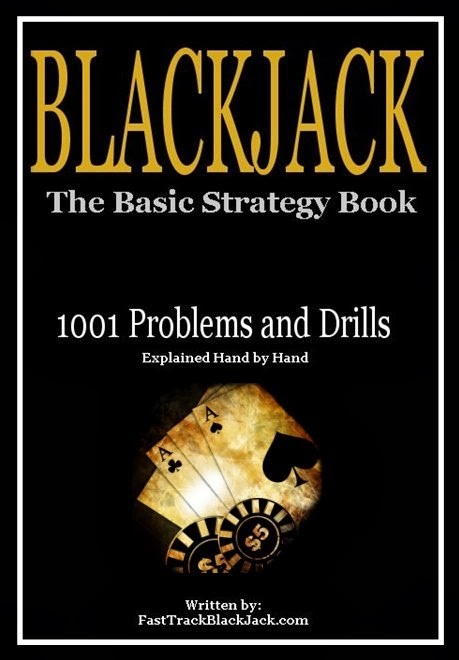 Blackjack: The Basic Strategy Book - 1001 Problems and Drills is available now on Amazon.com. The book is a first of its kind; It will visually drill into your mind how to correctly play every possible blackjack hand by using visual computer graphics of real blackjack hands which help reinforce the learning of basic strategy play. With over 500 blackjack tables and images on every page, this book is for both beginners and advanced students who want to sharpen their basic strategy game. There is no doubt that all professional players uses basic strategy during the course of their play. It is an essential tool for all blackjack players who want to win more money. 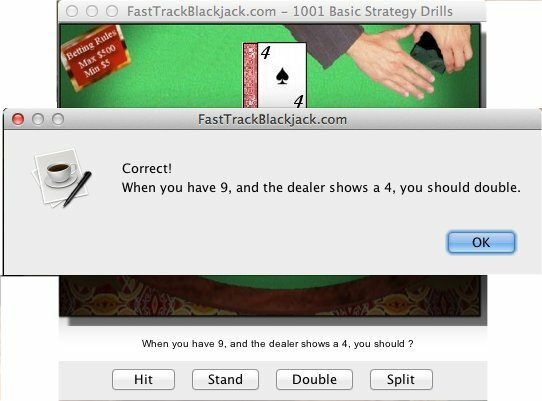 FastTrack Blackjack™ – 1001 Basic Strategy Drills will help you quickly learn basic strategy. In addition to clearly stating the rules of basic strategy, this book will visually present practice drills and exercises which will reinforce your learning. The visual exercises will feel like you are sitting at the blackjack table with the dealer, looking at real cards, and playing real blackjack. There are over 1001 basic strategy drills and exercises for you to enjoy. Every drill and question in this book is presented visually to help you memorize the basic strategy rules. It is organized into specific sections for hard hands, soft hands, and pairs. This book will help you practice, develop and tone your basic strategy blackjack skills to make you a better blackjack player. In just a short time you will be a master of basic strategy, and will be able to decide what every player at the table should do for every hand dealt. Since the exercises and practice problems were generated by our own FastTrack BlackjackTM Computer Simulator (available for download on our website), every possible blackjack hand is analyzed and visually taught to you. We invite you to take your blackjack game to the next level! FastTrack Blackjack™ -Basic Strategy Computer Game! 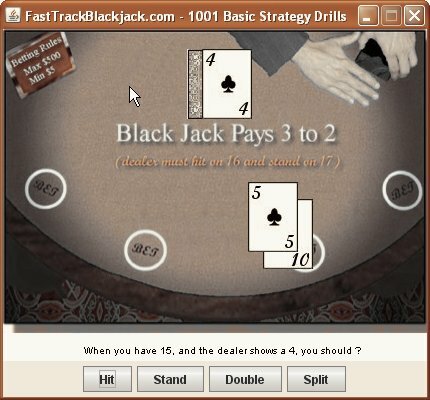 Now you can download and play the FastTrack Blackjack Basic Strategy Computer Simulator on your home computer. This computer simulator was used to create all of the practice drills found in the Blackjack: The Basic Strategy Book - 1001 Problems and Drills. The game works on both PCs and Macs. It is a very simple yet powerful game that only focuses on asking basic strategy questions. This program is ideal for you to practice just the scenarios that you want to work on. Perhaps you are weakest on soft-hands, or splitting pairs, if so just choose those types of questions and the computer simulator will only ask those types of questions. As you play the game, and answer incorrectly, the game reinforces the correct learning by teaching the basic strategy rules that are used throughout the FastTrack Blackjack Book. At the end of the game, the computer simulator will tell you the number of questions that you answered correctly, and report your score to you. Download a free preview of the FastTrack Blackjack: The Basic Strategy Book - 1001 Problems and Drills from here. Download a Free Book Preview! FastTrack Blackjack: The Basic Strategy Book - 1001 Problems and Drills is a blackjack book that will visually teach you how to play basic strategy. "A perfect book to read on my way to the casino!" "Awesome book! Love that I can just practice the sections on splitting and soft hands…"
"Great game app! Now I can practice basic strategy on my computer to prepare…"
" I highly recommend this book and PC game!"